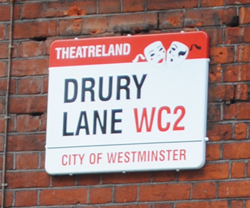 Famous for its associations with London’s theatreland, Drury Lane takes its name from the Drury family who once owned a mansion here. Previously known as the Via de Aldwych (apparently for a stone monument the Aldwych Cross which stood at the street’s northern end), Drury Lane – which runs between High Holborn and Aldwych – was renamed after Drury House which was built at the southern end of the street. Some accounts suggest it was Sir Robert Drury (1456-1535), an MP and lawyer, who built the property around 1500; others say it was his son, Sir William Drury, also an MP and a Privy Councillor, who did so in around 1600 – which may mean there were two versions of the one property. The street, meanwhile, is said to have been briefly renamed Prince’s Street during the reign of King James I (1603-1625) but, following the Restoration in 1660, the name Drury once more gained supremacy. The origins of the street’s famous theatre (London’s oldest), the Theatre Royal Drury Lane, dates from the same year (see our earlier post here). Other theatres in the street included the Cockpit Theatre which had been designed at one stage by Inigo Jones. The street is also famous for being the site of the worst outbreak of the plague in London – the Great Plague of 1665, burned away the following year by the Great Fire – and by the 18th century was a slum noted for its seediness, in particular for prostitution (it features in William Hogarth’s work The Harlot’s Progress). This didn’t change until the second half of the 19th century – author Charles Dickens had been among others who had commented on the poverty he had seen there – when gentrification took hold. Among the shops opened there during this time was the first Sainsbury’s, founded at number 173 in 1869. Alongside the Theatre Royal Drury Lane (although the main entrance is in Catherine Street), other theatres in the street today include the New London Theatre and the London Theatre.